“A race divided, whom the sloping rays; the rising and the setting sun surveys…” Most researchers assume that the ancient assertion of Kushites ruling the Middle East from Phoenicia to Syria is pure myth, however seals and other inscriptions of the Hyksos King Apophis suggest there may be some truth to the stories told by famous figures such as Homer and Strabo. Around 800 BC, the Greek poet Homer mentions the Aethiopians, or Kushites, in the Iliad and the Odyssey. Homer said that the Kushites were “the most just of men, the favorites of the Gods”. To the Greeks and Romans there were two Kush empires, one in Africa and the other in Asia. Homer alluded to the two Kushite empires when he wrote in the Odyssey i.23: “a race divided, whom the sloping rays; the rising and the setting sun surveys”. In the Iliad. i.423, Homer wrote that Zeus went to Kush to banquet with the blameless Ethiopians . In 64 BC, the Greek geographer and historian Strabo stated in Chapter 1 of Geography that there were two Kush empires - one in Asia and another in Africa. In addition to Kush in Nubia and Upper Egypt, some Greco-Roman authors considered their presence in southern Phoenicia up to Mount Amanus in Syria. Most researchers have assumed that the Greco-Roman assertion that the Kushites ruled the Middle East from Phoenicia to Syria was a myth, however seals and other inscriptions of the Hyksos King Apophis suggest that the ancient authors were right. The Hyksos ruled Egypt from about 1650-1550 BC. There were five Hyksos kings, but the most famous was Apophis. King Apophis ruled both Lower and Upper Egypt. We don’t know how long Apophis ruled Upper Egypt and Kush in Nubia, but it is said his reign lasted 40-50 years. 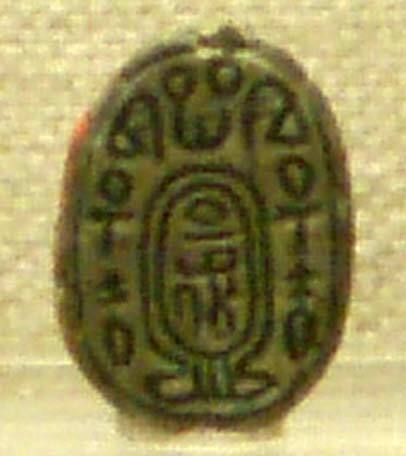 Apophis’ Horus name, Shetep-tawy, was found on an offering table. Pharaoh Apophis had three praenomina or throne names: Neb-khepesh-Re ( nb ḫpš r ˁ), A-qenen-Re ( ˁ3 ḳn n rˁ ) and A-user-Re ( ˁ3 wsr rˁ ) during different parts of his 40-50 reign. Apophis maintained the traditions of the Egyptians during his rule. He is credited with encouraging his scribes to copy priceless Egyptian texts including the 'Edwin Smith Surgical Papyrus' (the oldest known surgical handbook), ‘the Rhind Mathematical Papyrus’ (which explains Egyptian mathematical theory) and the ‘Westcar Papyrus.’ These texts would have been lost to mankind if not for the foresight of Pharaoh Apophis. It is interesting that Apophis and the other rulers of the Hyksos Dynasty called themselves heqa khasut on their seals and a monumental doorjamb from Avaris. This is epigraphic evidence indicating that the Hyksos called themselves Kings of the Khas. The Hyksos worshiped Seth, the god of Avaris, and Ra. Most researchers have translated heqa Khas as “King of foreign lands,” but this is probably an incorrect translation because the Hyksos Kings were rulers of Egypt - not a foreign land. I believe that Apophis and the other Hyksos kings were acknowledging their Kushite origins. They used Khas in reference to the fact that, although they came from Asia, they were Kushites. This view is supported by the fact that the term Khas was only used to refer to the rulers of Kush during the Old Kingdom and the area around Avaris and Sharuhen during the Second Intermediate Period. Some three centuries after the first recorded major encounter between the Egyptians and the Kushites, King Snofru of Egypt is recorded to have attacked the land of the Kush in Nubia, bringing 7,000 living prisoners and 200,000 large and small cattle. We learn from the Weni Inscription that Kushites lived in Nubia. Breasted’s translation of the Weni Inscription indicates that Heqe Khasut was not always translated as ‘Kings Foreign “, the original meaning of ḥḳЗ (Heqa) ḫЗs (Khas), was “Kings Negroland “, as indicated in the Breasted translation. There was no such place as ‘Negroland’, it was a Eurocentric term where Blacks were supposed to live. So, the actual meaning was ‘Kings Khas’ or kings of the Kushite. The term Haqe Khas (xЗs) was related to Wawat rulers and was translated as “Rulers of Negroland. The Egyptian elements / -u-t/ were added to Khas to make it plural and denote a nationality. The Weni Inscription makes it clear that the name Khas was made up of three N25 signs from Gardiner’s List of Egyptian Signs . The N25 sign also represents Kash = Kush. The meaning of N25 as Kush and Kushite is obvious in the Hyksos scarabs, where we see N25 as the people the Hyksos Kings ruled. The Hyksos, according to John Bright and Robert Drews, included Hurrians and Hattians. The Hattians lived in Anatolia. When they migrated from Middle Africa to Asia, the Kushites continued to call themselves Kushites. This is most evident in place names and the names of gods. The Kassites, chief rulers of Iran, occupied the central part of the Zagros. The Kassite god was called Kashshu, which was also the name of the people. The K-S-H, name element is also found in India. For example, Kishkinthai was the name applied to an ancient Dravidian kingdom in South India. It should also be remembered that the kings of Sumer were often referred to as the " Kings of Kush". The Hattians worshipped Kasku and Kusuh. The Hatti controlled the city state of Kussara. Kussara was situated in southern Anatolia. The Hatti were especially prominent in the Pontic mountains. Hatti’s sister nation in the Halys Basin were the Kaska tribes. The Kaska and Hattians share the same names for their gods, along with personal and place names. The Kaska had a strong empire which was never defeated by the Hittites. 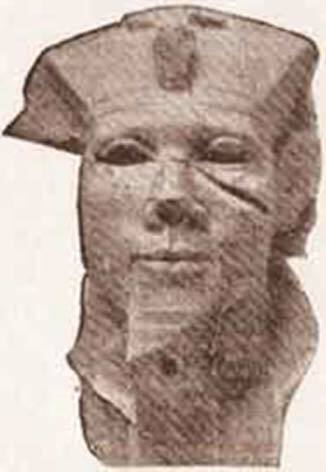 The Hatti were probably one of the Kushite tribes in Nubia during the Old Kingdom. During the Fifth Dynasty of Egypt (2563-2423) in the reign of Sahure there is mention of the Tehenu people. The C-Group people occupied the Sudan and Fezzan regions between 3700-1300 BC and were called Tmhw (Temehus). The Temehus were organized into two groups: the Thnw (Tehenu) in the North and the Nhsj (Nehesy) in the South. A Tehenu personage is depicted on Amratian period pottery. The Tehenu wore a pointed beard, a phallic-sheath, and feathers on their head. Sahure referred to the Tehenu leader as “Hati Tehenu”. The name Hati corresponds to the name Hatti - a tribe in Anatolia. However, the Hatti people often referred to themselves as Kashkas. Egyptian Khas corresponds to Kashkas, the name for the Hattians. This means that N25 represented the name Kash and Khas for the ethnonym Kushite during the 5th Dynasty of Egypt. The Egyptian term Khasut has three different elements for the ethnonym Khas: Kas(ka)/Kush. Plus, the /-u/ which is the Egyptian plural marker, while the Egyptian /-t/ was a suffix that signified 'land, people'. During the 5th Dynasty of Egypt, the Kushites lived in hilly areas. Thus, the Egyptians often referred to the Kushites as hill people. This is supported by the various meanings of Gardiner's Egyptian sign N25. 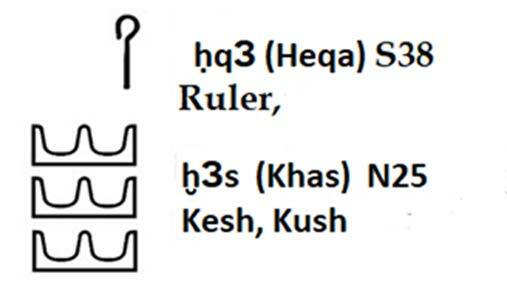 The N25 sign from Gardiner’s List of Egyptian Signs; xЗs Khas or kЗs, meaning Kush. 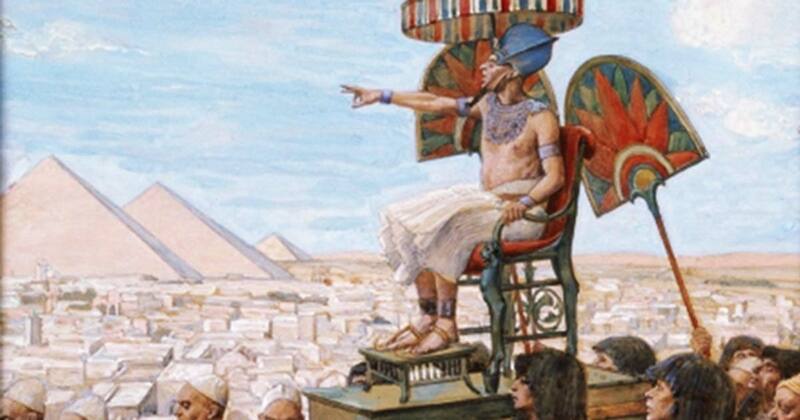 The Old Kingdom rulers of Egypt called the Kushites Heqa Khasut. The Egyptians called the Asians generically Aam, but they had different names for Asian tribes. This is proven because the Hyksos called themselves Heqa Khas, instead of Habiru, demonstrating that they were given this title because they were Kushites - like the Kushite people living at Kerma in Nubia. The use of Khas to denote Kushite for the Asian Kushites would support Homer and Strabo’s writings. There were many Asian tribes who recognized a Kushite ancestry. The heqa khas, "ruler(s) of the Kushites" or Hyksos/Hykussos, were Hattians or Kashkas. In other words, they were Kushites. This is obvious in their name khas, which corresponds to Kaska. The name heqa khas was first used in the Old Kingdom to refer to the Kushite Nubian chieftains. Carnarvon Tablet I mentions the interception and capture of a courier bearing a message from Apepi/ Apophis at Avaris to his ally, the ruler of the Kingdom of Kush (modern Sudan), requesting the latter's urgent support against the threat posed by Kamose's activities against both their kingdoms. The Hyksos/Hykussos expected the Kushites in Nubia to support them in their war with the Egyptians. In summary, Apophis and the other Hyksos kings have left us many inscriptions where they declared they were Kings of the Kushites, heqa khas, between 1650-1550. The Egyptians called the Asians ‘Aamw, but the Hyksos referred to themselves as heqa khas. The New Kingdom lasted from 1549-1292. During that period Egyptians used the name Aamw as a generic name for Asians and the term Habiru as an ethnonym for one of the Asian tribes. It is clear that if Habiru and Heqa Khas were the same people they would have had the same name - given the fact that the New Kingdom began at the end of the Heqa Khas Dynasty. The Egyptian phrase heqa khas “King of the Kushites” makes it clear s ome of the Hyksos were Hurrians and Hattians. The Hattians and Kaska tribes are the Kushites Homer and Strabo claimed lived in Asia. The heqa khas were by no means the first Asians to settle in Lower Egypt, prompting some to suggest that there was no major battle, just a steady influx of settlers who worked themselves into positions of power while retaining their own cultural differences. Evidence from the excavation at Tell el-Dab'a (Avaris) confirms that the settlement was constantly evolving and changing as the new Asian cultures adapted to the Egyptian way of life. Settlements discovered in Tell el-Ajjul (southern Palestine), Ebla (Syria), and Byblos (Lebanon) share many characteristics with the Hyksos settlement at Tell el Dab'a. No matter the changes Asians brought to Lower Egypt, Apophis maintained Egyptian traditions, arts, and sciences and left an important testimony to the rulers of the Kushites in Lower Egypt. John Bright. (2000). A History of Israel. Westminster John Knox Press (p.60). Eric H. Cline and Jill Rubalcaba. (2005). The ancient Egyptian World. Robert Drews. (1 October 1994). The Coming of the Greeks: Indo-European Conquests in the Aegean and the Near East. Princeton University Press (p.254). Camille DiBiase Dyson. (2013). Foreigners and Egyptians in the Late Egyptian Stories. Marc Van De Mieroop. (2010) A History of Ancient Egypt. Kim S. B. Ryholt. (1997). The Political Situation in Egypt During the Second Intermediate Period, c. 1800-1550 BC. University of Copenhagen, Denmark.